“It is in fact Andrews’ subtle direction of ‘the thinking person’s musical’ that leads to the dramatic interactions giving new vitality to a stage favourite,” writes HELEN MUSA. Photo by Jeff Busby. THE reputation that “My Fair Lady” has of being “the perfect musical” is entirely justified if this reprise of Julie Andrews’ record-breaking production for Opera Australia and John Frost is anything to go by. The young Andrews was of course the star, opposite Rex Harrison, of the 1956 Broadway premiere of this musical by Lerner & Loewe, adapted from George Bernard Shaw’s play “Pygmalion” and Gabriel Pascal’s motion picture of the same name. People might think that the huge success of the production is entirely attributable to audience nostalgia, but that’d be wrong. 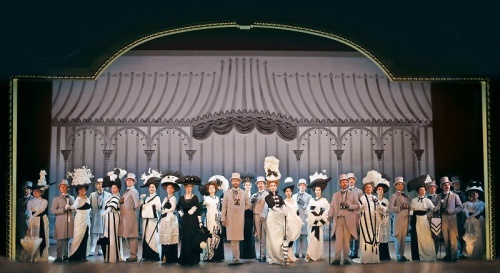 While certainly the lavish staging by Oliver Smith and costumes by Cecil Beaton, where recreated by John David Ridge, down to the finest detail (where two ladies at Ascot are seen wearing the same outfit). But it is in fact Andrews’ subtle direction of “the thinking person’s musical” that leads to the dramatic interactions giving new vitality to a stage favourite. 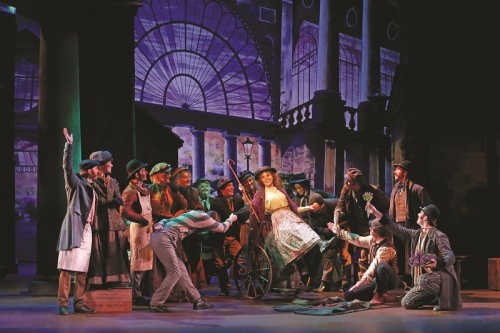 To be sure, musical director Guy Simpson ensures that the well-loved songs and dances have audiences humming along and the spectacular choreography by Christopher Gattelli brings to life the Covent Garden street scenes in a manner rarely to be seen. But to my mind, it is the acting performances by the central characters that carry the day. 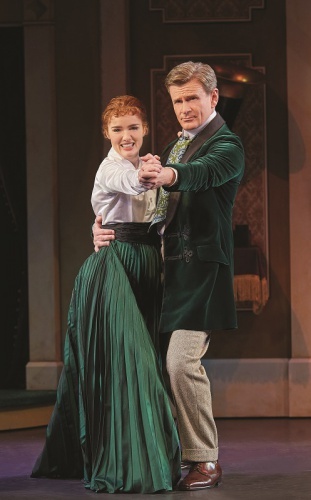 Central to these is the part of Eliza Doolittle, played by Australia’s Anna O’Byrne, whose crystalline voice sounds uncannily like the Julie Andrews of yesteryear. Although it’s true the script demands a rapid transition from the scruffy flower girl of Act I to the elegant but notoriously worldly “lady” at the Ascot races, O’Byrne makes a credible go of her ascent into the upper classes. By the final act, Eliza carries herself with dignity, even to a little upward tilt of the chin. And the last scene could make people doubt she’ll be Henry Higgins’s chattel. Charles Edwards as Professor Higgins is at a disadvantage in one respect at least. His scurrilously patronising remarks – calling Eliza “a cabbage-leaf” is the kindest of them – are now largely unacceptable to an audience. His easy, flippant condescension, although funny when he hits the mark, reveals a man who is out of touch and in that sense no more a man than the lovesick Freddy Eynsford-Hill, (sung beautifully by tenor Joel Parnis) whom he scorns. 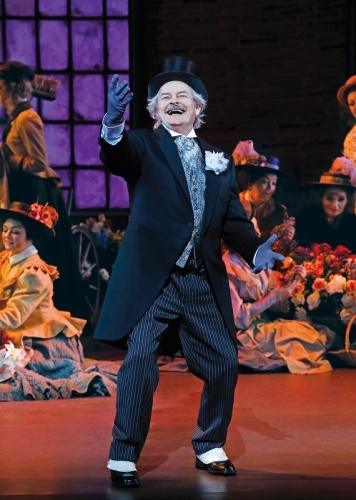 The controversial last seconds of “My Fair Lady” are almost but not quite destroyed when Edwards/Higgins inclines his hat over his eyes in a gesture of complacency. Shaw went to his grave asserting there should be no hint of romance between Higgins and Eliza, and on the whole Andrews’ production honours that view, with little sentimental overworking of the one-to-one exchanges between the pair. This places the burden of humanity on Eliza and the main supporting characters, Tony Llewellyn-Jones as the kind but blustering Colonel Pickering and Robyn Nevin as Mrs Higgins, refined but sharp and worldly. The two actors help round out the world and character of Higgins. As the amoral dustman/philosopher Alfred P Doolittle, Reg Livermore gives a joyous, scintillating performance, one of his very finest, even again as he rages against middle-class morality. For even as the audience taps its toes through this handsome, lavish production, and especially gasp at the visual beauty of the Ascot scene, there is no escaping the underlying message proclaiming the bankruptcy of the British class system. Julie Andrews, the musical directors, the choreographer, the designers and the whole cast clearly understand what underlies this perennial work.